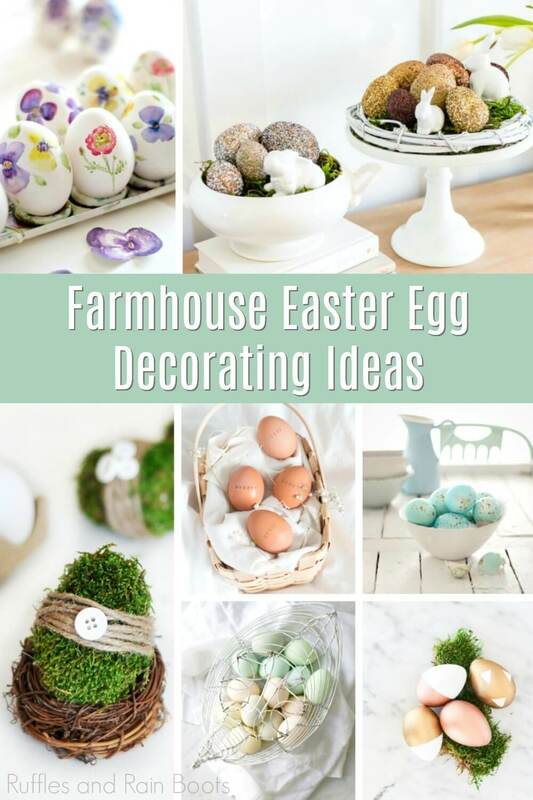 I am so in love with these easy farmhouse Easter egg decorating ideas that I am sad Easter is almost here! It feels like I just put out my farmhouse tiered tray and hand lettered my Easter eggs. Too soon, this fun holiday is over. But not before I get a few more fun farmhouse Easter decorating ideas out of my system! LOL! Here at Ruffles and Rain Boots, we fall more in love with our farmhouse decor with every change of the seasons. It’s no wonder that we’ve found 20+ ideas to bring that farmhouse vibe into our Easter decorations. I started my love of Easter decorating ideas with this DIY Farmhouse Tiered Tray. It’s so simple, but perfectly perfect in every way–and it went together so fast, I had time to make a few more fun farmhouse Easter ideas. And I am so happy with how these Hand Letter Easter Eggs turned out that I just want to have them around all the time. They’re so pretty, and the kids can find their “letter”–it’s just a fun twist on the tradition. Speaking of a fun twist, this Farmhouse Sign For Spring is so simple, it’s got “ready for EVERY season” just waiting to happen to it. But, right now, it’s adding to my Easter charm. I’m dying to make these Embroidered Felt Easter Eggs to fill my little one’s basket. She loves little felted animals and veggies, so these will be a fun year-round toy for her! This Basket O’ Faux Speckled Farmhouse Eggs looks like it would be so fun to make and the kids might even be able to help! Can you imagine the fun we’d have?! I have always wanted to give this Naturally Dyed Easter Eggs Tutorial a try. So much fun to bring that whole farmhouse feeling into everything–even your activities. 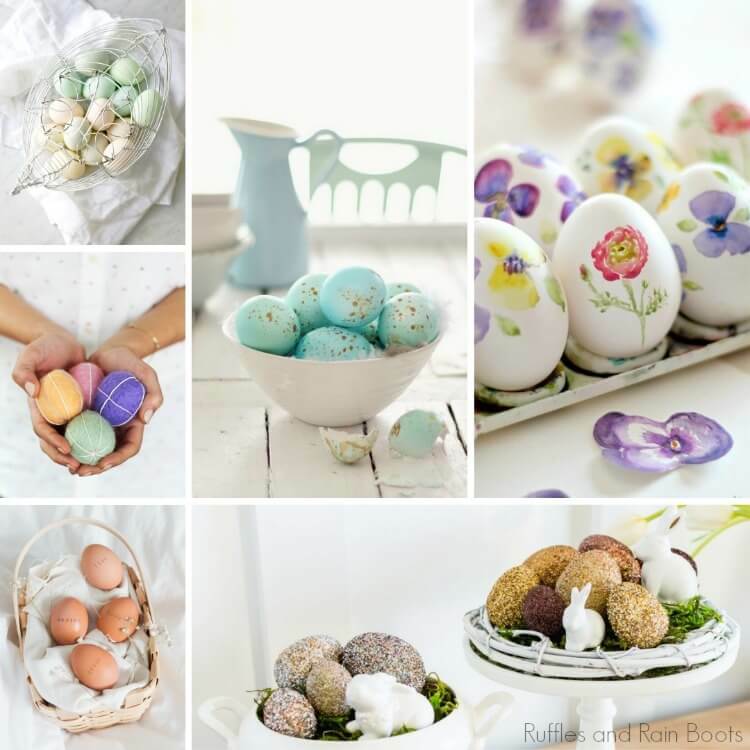 Why, I am in love with these DIY Modern Easter Eggs, although I think they’d fit my farmhouse Easter decorating scheme so well. I might be making those tomorrow…we’ll see! This Speckled, Beachy Dyed Easter Egg DIY is another beautiful naturally-dyed egg project that I would LOVE to do with the kids. It would be so fun to teach them how to dye with food. You’re busy, I get it. Pin these farmhouse Easter egg decorating ideas to your favorite Easter decorating ideas board on Pinterest and it’ll be here for when you’re ready. 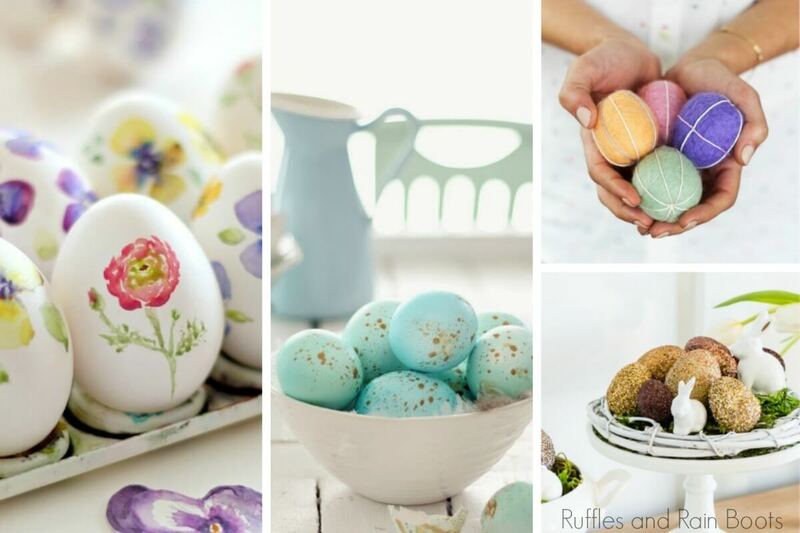 I am just floored by how cool these Pottery Barn Inspired Glitter Easter Eggs are. I mean, simple, fun, and just straight-up elegant. And definitely a project I could do with the kids. DIY Stamped Easter Eggs might be more my older daughter’s speed, though. She’d love the idea of stamping her favorite words onto an egg–or 20. These Watercolor Eggs are the most beautiful, perfect little eggs ever in the history of beautiful eggs. I mean, seriously…I don’t even know how to describe how pretty I think they are. And if you’re not intrigued by turning wicker into these Farmhouse Style Metal Baskets to display your pretty eggs, well, I’m not sure I know you. LOL! This simple, but smart tutorial for How To Dye Eggs With Food Coloring is the egg-dyeing tutorial I’ve been missing my whole life. I will definitely be opening this How To Make Speckled Eggs tutorial to make eggs for the kids–so fun! If I can find some denim that needs a new life, I am DEFINITELY tackling these Upcycled Denim Eggs. Would you like inspiration delivered right to you each week? Sign up for the once-weekly Ruffles and Rain Boots newsletter and you’ll get that and more! Get access to the exclusive libraries full of free SVGs, hand lettering practice, and so much more. DIY Metallic Easter Eggs will DEFINITELY grace my Easter tablescape this year for Easter brunch. Just you watch. I can’t wait to follow this tutorial for How To Make Super Simple Shabby Chic Easter Eggs and make my own! Here’s another perfectly easy How To Dye Easter Eggs Naturally tutorial that I really want to try. It just looks like so much fun! Oh, theseMoss Covered Easter Eggs are RIGHT up my alley. They’re cute, fun, and totally go with the moss I have stashed in my tiered tray! I am for real going to make thisEaster Egg Topiary to give to my mom–she will LOVE how cute it is. And I’ll love how simple it is. I could definitely see theseDIY Faux Concrete Eggs gracing my farmhouse Easter egg decor. So cool looking–and very simple, it’s getting hard to decide which to do! Ok. These Golden Speckled Eggs definitely win. This. This is what I’ll be making today. Because, you know, blue is the best color ever. Your shares are how this site grows and I am sincerely grateful. Know a friend who’d like this? Please share it on Facebook or save it to your favorite farmhouse Easter decorating ideas board on Pinterest.